DS 9808-R - Multitasking made easy! The DS9808-R is not only the first combination 1D/2D bar code scanner and RFID reader, it also represents a new RFID product category — the first combination handheld/hands-free UHF RFID reader. In addition to UHF RFID tags, the DS9808-R offers the very latest in imaging technology, delivering record swipe speeds for 1D and 2D bar codes, as well as the ability to capture images and signatures. 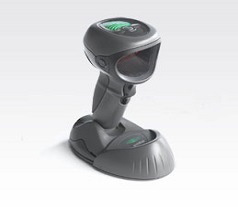 Truly designed for ease of use for both hands- free and handheld scanning; dynamically switches between modes. Offers Motorola's best-in-class advanced data capture capabilities for superior application flexibility - enables the capture of UHF RFID tags, 1D, 2D and PDF417 symbologies as well as images and signatures; eliminates need for multiple devices. Easy to use; no need to align item and scanner; virtually no training required.